Here is an update post on the off chance you’ve been wondering what’s been happening during the bike tour intermission. The first priority was to do everything possible to get Jordan back to full health. 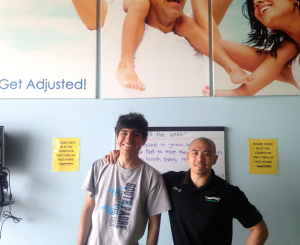 We took him to see Dr. Q. at Pinnacle Wellness for several chiropractic visits with neck and shoulder muscle therapy treatments as well as an infrared sauna session. With each visit his health improved. This was combined with rest, hydration and specific nutritional supplements from our Health Coach, Penny Muckleroy of Your Wellness Plan. In the meantime, I was coming to the realization that I would need to transition the tour from supported to self-supported. I had always known that Jonathan would only be with us through April. It had always been the plan for the tour continue with Jordan, Ladybird and myself. However, with the severe sickness Jordan experienced we decided that it would be best for him to stay home and for me to continue the tour solo. Roger and Susan continued riding the Southern Tier when we left them in Deming, NM. Each day they rode was another day they were getting closer to me in San Antonio, TX. While I was chomping at the bit to get back on the road, the priority was Jordan. I knew that once Jordan was back to good health I would rejoin the tour. Riding self-supported meant that I would need to figure out how to take all of the clothes, cosmetics, bike repair supplies/tools, emergency food and a sleeping bag on my bike. At first I thought about stuffing it all into a backpack. 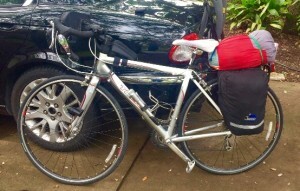 I had researched ultra-light bike touring a few months ago and knew it was possible. We had even run into two young German bicycle tourists in Alpine, CA who were riding the Southern Tier with backpacks. However, when I tried fitting everything into my backpack, I discovered this would not work for me at all. The next logical step was to find a rear bike rack which would fit on my Trek 1.2 road bike. I was thrilled when my local BikeWorld had one in stock that fit my bike perfectly. My plan was to bungee the waterproof bag that contained my clothes with my sleeping back onto the top of the bike rack. The salesman at BikeWorld told me I really needed to look into bags for the rear rack. Roger also expressed concern about me being able to bring everything I would need for a self-supported tour unless I had bags. Luckily, I remembered Henry Parrilla from Bike Seven had mentioned his bike touring adventures when we took his bike mechanics class before the start of the tour. I contacted Henry and he did indeed have some bags I could borrow for the trip. My road bike now looks more like a proper touring bike. At this point with Jordan now back to his happy-go-lucky healthy self, it is time to get the show back on the road. Roger and Susan will be in Del Rio, TX in a couple of days. I have my bike packed, prepped and ready. 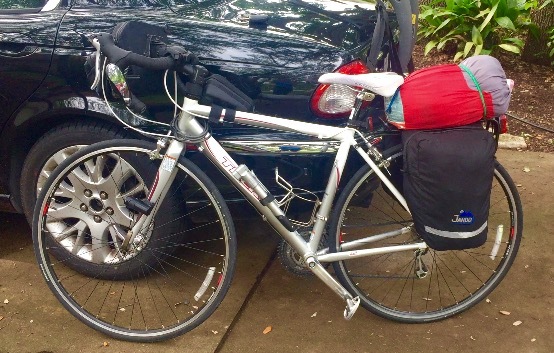 I weighed the load that will be on the rear rack of my bike and am happy to report that I am coming in at just under 20lbs. This is really great news for me because that means I am not having to pedal too much additional weight and my aluminum road bike can still deliver a relatively nimble ride. When I left the tour on April 18th, I wasn’t sure how long the intermission would last. Originally, I thought a couple of days at the most. I had no idea I would be gone for 10 days. I have missed riding 117 miles of map 2 and all of map 3 (496.5 miles). Roger and Susan’s actual map 3 mileage is less than the 522 miles of the Adventure Cycling Association’s Southern Tier Official Route. We stopped following ACA maps whenever it took us to scenic mountain routes. I think the terror filled ride from Superior, AZ to Miami, AZ cured us of any need to ever ride narrow mountain roads. I think Roger said it best, “If we really want to see the mountain views we can always rent a car and drive through them.” Susan and I whole-heartedly agreed and happily went off-route on flatter roads with wide shoulders. Truth be told, map 3 was the section of the map that I was looking forward to riding the most in Texas. I love the Ft. Davis, Marfa, Alpine area. It’s one of my favorite getaway locations in Texas and I make trips as often as possible. 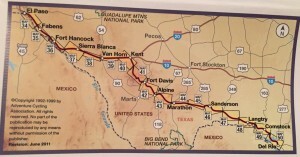 The idea or riding up to the McDonald Observatory and down to historic Ft. Davis really appealed to me. Another section on map 3 that would have been a highlight was the huge bridge that crosses the Pecos River. The view is stunning and I was excited about the challenge of riding up that steep bridge. 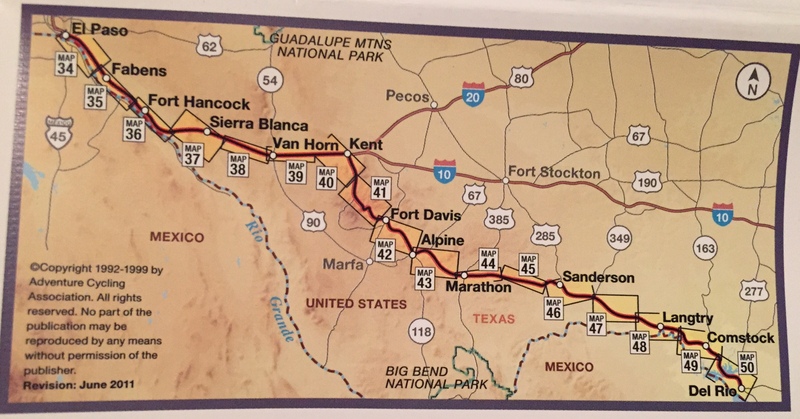 When it became apparent that I would not be able to meet Susan and Roger until they made it into Del Rio, TX I knew that I would have to make up that section of the map another time. There was a part of me that considered going back to Deming, NM to complete the tour riding solo. That was quickly put out of consideration after mentally reviewing my tour experience riding thus far. I know that traveling with a group even a small group is much safer. There is more of a chance that drivers will see you if there are more of you to see. With the summer heat fast approaching, it looks like a ride from San Antonio, TX to Del Rio, TX and up to Deming, NM will be in order sometime during the fall months. It’s my plan to go back to the Crazy Guy on a Bike site to join a group traveling west along the Southern Tier to complete my journey. So, there you have it. The summary of what’s been going on since the bike tour intermission began. The riding fun is about to start up again. You have no idea how much I’ve missed riding. I have been living vicariously through Roger and Susan’s daily posts on their journal. Now it’s time for me to start experiencing the open road as I pedal the rest of the 1,682.5 miles of the ACA Southern Tier.